How to make hodgepodge of documents orderly? Request : If you are working on PDF document that is hodgepodge of other documents, and you wish to paginate the entire file. Is there a way that you can add page numbers with some program on VeryPDF? Solution: Convert all the documents to PDF file and add page number for PDF file. Step 1:Convert all the common documents to PDF files. The following VeryPDF software can help you make it. 1. Doc to Any Converter can be used to batch convert DOC, DOCX, DOCM, RTF, TXT, PPT, PPTX, XLS, XLSX, OpenOffice ODT, HTML, MHTML files to PDF, Postscript, PS, EPS, SVG, SWF, XPS, PCL, HPGL, HTML, MHTML, RTF, Text, XML, JPG, TIFF, EMF, WMF, BMP, GIF, PNG, TGA, PCX, etc. formats. 2.Document Converter can convert any printable document to more than 50 formats including PDF. 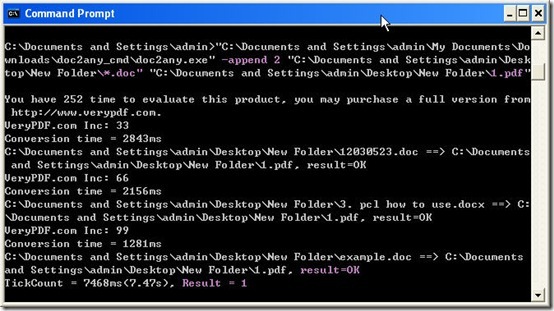 Take a random folder for example using DOC to Any Converter. 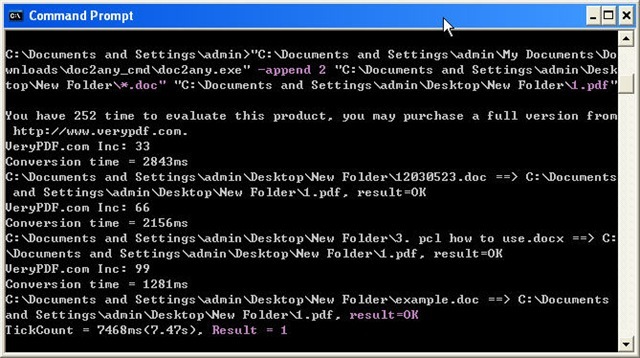 You can download it here:http://www.verydoc.com/doc2any_cmd.zip It is a command line software,which can be used together with other application.In the following operation, I will add all the word document files in this folder to an existing PDF file. As to the details, please refer to the following snapshot. Step 2: add page number for PDF file. PDF Stamp v2.3 can help you finish this task for you. You can download this software and have a free trial from this link: http://www.verypdf.com/pdfstamp/pdfstamp_cmd.zipIt both has GUI version and CMD version. But in this process adding page number,I will use its CMD version. As to detail operation, please refer to the following command line and one example in the snapshot. I can not list all the parameters introduction here. If you need to know more details, please refer to this page:http://www.verypdf.com/pdfstamp/pdfstamp_cmd/pdfstamp_manual_cmd.htm By this way, you can make all your files orderly and clearly. If you have any question about this software or all the PDF software, you can contact us by ways stated on this website. How to convert URL to ps using Document Converter? How can I number PDF document sequentially yet skip a few pages? How to stamp PDF by command line? This entry was posted in PDF Stamp. Bookmark the permalink.